The proteolysis of collagens plays an important role in numerous physiological and pathological situations such as morphogenesis, wound healing, arthritis, arteriosclerosis, and tumor metastasis. Triple helical type I collagens are made up of two α 1 (I) and one α 2 (I) chains, and are found in skin, tendon, ligament and interstitial tissues. Due to their fibrillary structure native collagens are resistant to most proteases. They are substrates however for certain matrix metalloproteinases (MMPs), which constitute a family of zinc-dependent enzymes catalyzing the degradation of extracellular matrix components [1,2]. Initial MMP-8 dependent cleavage of collagen into the characteristic ¾ and ¼ fragments has been shown to enable MMP-9 diffusion along the protein helix, with preferential binding to the collagen ¾ fragment tail. Finally, untwisting of the helix end results in the local denaturation of the triple helical structure . Song F., Wisithphrom K., Zhou J. & Windsor L. J. (2006). Matrix Metalloproteinase Dependent and Independent Collagen Degradation. Frontiers in Bioscience, 11:3100-20. Bertini I., Fragai M., Luchinat C., Melikian M., Toccafondi M., Lauer Ja. L. & Fields G. B. (2012). The Structural Basis for Matrix Metalloproteinase 1 Catalyzed Collagenolysis. J. Am. Chem. Soc. 134(4): 2100–2110. Rosenblum G., Van den Steen P. E., Cohen S. R., Bitler A., Brand D. D., Opdenakker G. & Sagi I. (2010). Direct Visualization of Protease Action on Collagen Triple Helical Structure. PLoS ONE 5(6): e11043. 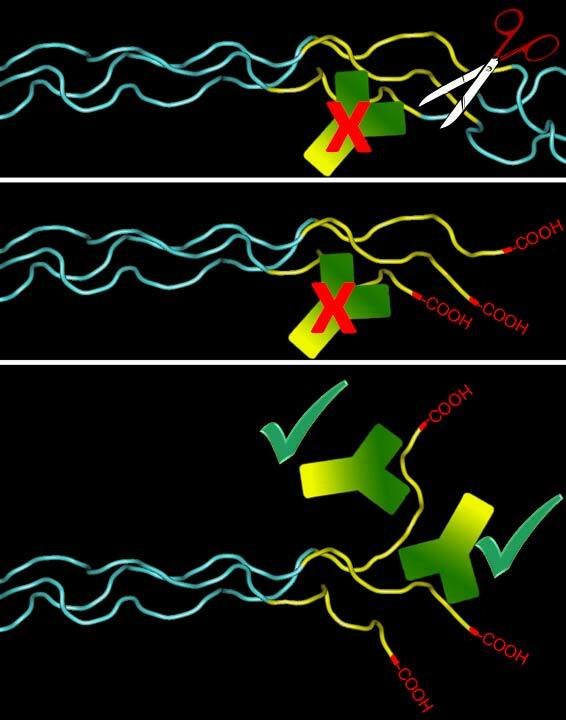 Model depicting antibody detection of Col1 ¾C. MMPs cleaving the α chains, create free COOH groups at the C-terminal end of the ¾ fragment, which gets untwisted and exposes the antibody epitope. The carboxyl group proper is not part of this epitope. However, there is also a companion antibody available (IG-1266) that requires the free carboxyl group for binding (please enquire).